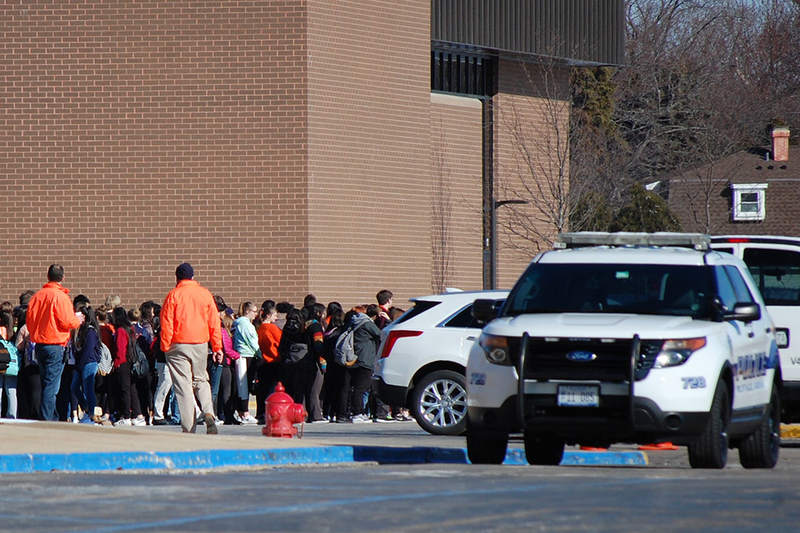 Students lined up outside Buffalo Grove High School in Illinois re watched by security. Photo by Stan Zoeller, MJE, and SPRC committee member. The walk-outs by thousands of high school students on March 14 did more than call attention to a revamping of the nation’s gun laws, they also provided Americans with several other things. And a realization that high school students today are doing what high school students did when I was in high school — speak up and demand to be heard. When Baby Boomers were in high school, we dealt with Vietnam, equal rights for women and the lowering of the voting age from 21 to 18.
discovered it has a voice that needs to be heard. Parents, politicians and school administrators need to listen. Two high schools in my hometown allowed students to participate in the March, although in different ways. One allowed students to congregate only near the main entrance. The entire campus was off limits to anyone with one security office saying it was because the march was a “school event,” which make no sense. Neither does the comment by another security officer who said I wouldn’t be allowed to take pictures because many of the students were minors. Spoken like a true flack. While the school blocked its main entrance, access was available through a second secondary entrance without any problem. The need for tight security is understandable. The display of local police officers at the first school was unprecedented for a “school event” – even the truck enforcement officer was there. By limiting students — as many districts did – including one which allegedly told students they could march if they didn’t say anything political, are educators limiting the opportunity for students to become civically engaged? One Chicago area district, Downers Grove District 99, reportedly issued nearly 1,000 detentions to students who were brazen enough to participate in marches at Downers Grove North and South high schools. The detentions, according to one media report, were in an auditorium where there were conversations about gun violence. A nice gesture, but what is the result of these conversations? Student voices need to be continuously heard in public, by the public and by lawmakers – not just by school administrators who are bent on control issues. Gun violence is not the first issue to fire-up student voices. A rash of shooting of African-American men in 2014 sparked the “Black Lives Matter” movement and was fueled by demonstrations and outcries le by young people who wanted their voices heard and action taken. Which raises the question – is squelching student voices the best practice if we want today’s high school students to become more civically engaged? They’ll find that what goes around comes around as it did in the Vietnam era of the 1960s. Students at the collegiate and scholastic levels were relentless in their actions and messages. Today’s students need to have that same relentlessness and resiliency, so their concerns become actions in the nation’s statehouses and in Washington, D.C.
People – whether students or not – need make sure their voices are continually heard and not silenced by overzealous school administrators or PAC-induced lawmakers. People’s voices, not silence, will make a difference. But only if people listen and act before it’s too late.